An 81 year old cartoon mouse is now in the hands of a prolific video game designer. Warren Spector is turning Mickey Mouse into a unique platform action RPG video game exclusively for the Nintendo Wii. It will be called Epic Mickey. Warren Spector has had a long history as a video game designer, involved with over 20 video games. Now that he has a hold of the highest profiled cartoon character of all time, only good can come of it. Mickey Mouse has been in many video games over the years, but it has been a long time since Mickey has stared in a new video game that is not watered down garbage geared only towards kids. The last notable adventures are the Disney’s Magical Quest games and Mickey Mania from the early and mid 90s. Classic platform video games placing Mickey in different worlds inspired by his cartoons of the past. Which Epic Mickey sounds like it took the key ideas that made those games great and brought them to a new generation. Another notable mention would be the Kingdom Hearts series, which at first glance sounds like Epic Mickey. Instead, Kingdom Hearts collided the Final Fantasy universe with the Disney universe resulting in a strange world of contrasting properties. Mickey is not the star and the main playable characters are Final Fantasy inspired, playing through Disney’s most memorable modern feature films. In Epic Mickey, the Disney universe collides with itself. Almost collapsing, leaving behind a bizarre and twisted amalgamation of its former self. 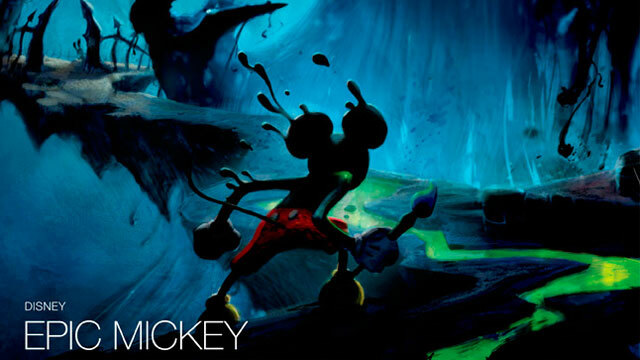 Instead of modern films, Epic Mickey feels to be inspired mainly of retro films and creations. Any thing created by Walt Disney himself or the Disney company, from the minds of Imagineers or from classic cartoons, actually used or unused has the possibility of being thrown into the mix. Some of the first concept art depicted a dark steam punk and decaying world. Newer concept art still has a dark tone but features classic Mickey cartoons mixed with current theme park rides, unused concept art, retired rides and forgotten cartoon characters. The most important of them all is Walt Disney’s own forgotten creation, Oswald the Lucky Rabbit. Oswald is bitter that Mickey became super famous and himself forgotten and left in the past. He is the primary antagonist in Epic Mickey and responsible for gathering together all the forgotten Disney creations to dethrone the top mouse. First creating the chaotic mixed up world with the help of the sorcerer Yen Sid. 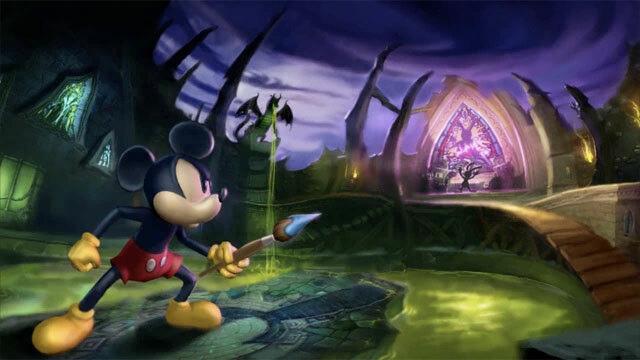 Epic Mickey’s world is dynamic and changes by the character’s direct and indirect actions. Most situations Mickey will be presented with, the player can fight, run away, help or ignore and end up changing the world around him by whichever action is chosen. Mickey will have the ability use paint and paint thinner to modify or erase objects in the world. Actions will also physically change Mickey himself between three different morality alignments. Changing between the good Hero Mickey and the bad Scrapper Mickey, with a Mickey that fits in between. You can fight your way through the game and become the Scrapper Mickey or you can correct the world and befriend the enemies and become Hero Mickey. The game goes as far as being able to avoid boss battles with the right actions. The game feature both a full 3D world and in between levels where Mickey is sucked into a movie screen and plays a side scrolling platform level inspired directly by one of his classic cartoons. The game is set to be released on September 16th, 2010. Warren Spector wishes for Epic Mickey to become a trilogy of games. If it is successful enough to deserve two more games, I will be wishing for it to be turned it to at least an animated short film. Warren Spector is also rumored to be wanting to create a brand new DuckTales video game. I believe anyone who has played the original NES version or it’s sequel would want a current generation version and would ask for more moon, please. Steamboat Willie was released November 18th, 1928, making Mickey Mouse 81 years old today. Even though technically Steamboat Willie was not Mickey’s first cartoon, it is popularly recognized as such, so today is recognized as his birthday. Happy 81st Birthday Mickey Mouse!